Reasons Why Women Love So Much Having Beauty Treatments At Salon – Self pampering with a salon treatment is a dream of most of women. Agree, does not it? Taking your time to stop by a salon on the sidelines of work or daily activities is something that may sound trivial. But in fact, such valuable time may be rare for some people! In recent years, the beauty salon industry continues to grow and expand vigourously. In the United States alone, every month there are more than 100 million people who come to salons. The majority are educated women at a young age ranging from 18 to 49 years old. The higher the income also affects the frequency of visits to a salon. Okey, now let’s analyze the women’s preferences of having beauty treatments. When it comes to a beauty treatment, women are faced with a vital choice: going to a salon or staying at home. Which one you choose? On one hand, some prefer salons because of considering its various services, professional staff, complete facilities, and convenience. On the other hand, there are also women who feel more free pampering themselves without having to leave the house. Well, this article will review some reasons why women are more prefer beauty treatment in a salon than at home. It isn’t too much, when someone claims can not move to another heart of their favourite salon therapist. The personal assessment and impression of each women about beauty salon cervices can vary. And, when someone already feels comfortable with a beauty therapist, hairstylist, nail technician or other personnel in the salon, do not be surprised if her visit to the salon will take place regularly. Believe it or not, in today's digital age, the existence in social media is taken seriously into account, especially by the younger women. One prove of their existence is by visiting a salon and having pictures while doing a treatment. The more prestigious the salon, the level of women’s existence will increase as well. Moreover, if the serving hairstylist is so well known. Of course, the women are crazy to get praised by their social circles. They might desperately be awaiting that somebody press their like buttons, share the uploaded photos, or give flattering comments. The next reason why women choose in-salon treatment rather than at home is still related to the above-mentioned point. Currently, beauty salons are competing to bring about captivatingly unique concepts to distinguish it from others. Either outdoor or indoor decorations, interiors, themes of the salon are designed as attractive as possible so as to drive women’s attention. Hence, women will be attracted to visit the salon, especially if they know that the salon’s interiors are so instagrammable enough. If the salon is extremely fascinating and has lots of instagrammable spots to take pictures, why stay silent at home? It turns out that undergoing in-salon treatment is one of the simple forms of recreation for women. Preparing to go to the salon, traveling around the city, having me time, and indulging yourself are several ways to kick out the boredom at home. Especially for those who spend more time at home, such as freelance worker or housewife, to which the boredom is likely to attack. Nowadayas, salons increasingly provide many complete facilities ranging from TV monitors, very comfortable seats, free Wi-Fi connection, or drinks. Not to mention the relaxing ambience, warm greeting, and pleasing hospitality that are seemingly not found at home. Indeed, the house can be transformed into a treatment place like a beauty salon. But certainly not as simple as that because the more adequate and complete equipments are in the salon. 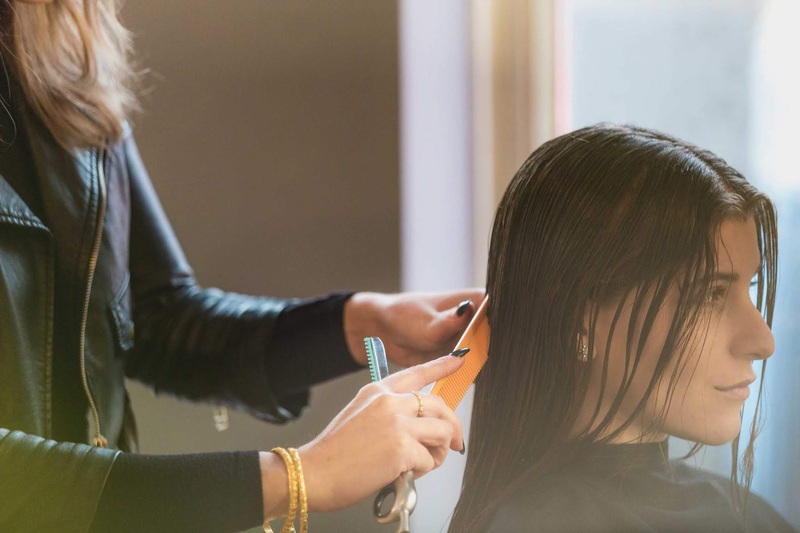 Especially if you want more complex treatment such as highlighting, hair spa, pedicure ,and other types of treatments that require large tools. Not to mention if you change a house space like a salon, of course there are more budget needed and extra efforts to do the installment. If you call mobile salon hairstylist, makeup artist or therapist to your home, you need to allocate some money to give them transportation fee. The further the distance the more money you have to spend. Sometimes, if you calculate the cost carefuly, having treatment in the salon is often more economical than calling a salon staff to your home. Socializing with beloved friends is frequently done by undergoing beauty treatments in the salon at the same time. The term is “girls day out”. It would be more fun and enjoyable to hang out with friends while pampering with salon treatment, right? Especially, if you have many friends that enliven the atmosphere, which you impossibly can get while at home only. A survey held a salon in Indiana, proved that 38 percent of women feel more confident and attractive after a visit to the salon. Even small things like the journey to and from the salon, arriving at the salon, sitting in the treatment chair, to undergoing the treatment itself is a fun and influential series of self-esteem. Maybe this is very closely related to the psychological aspects that may not be felt from home care, huh? One more thing that can not be realized while undergoing beauty treatments at home is consultation with the expert. When visiting a salon, you can ask anything that is related to the beauty things. The relevant doctor or specialist will be on hand to answer and do a consultation session. Their understanding must be much more comprehensive, especially after meeting directly and seeing your current condition. 88 percent of female salon customers admitted that they visited the salon to get free sample products. A salon is the ideal place for beauty brands to distribute and market their products to consumers. They provide branded booth in the salon that can make consumers curious of having a try. The interest to do treatments in the salon than at home is increasingly high along with the times. Significantly, the salon creates a pampering environment and atmosphere for its guests. The frequency and length of visits to the salon by guests is also affected by the level of the provided comfort. Not to mention the salon do continuously commercial activities like placing advertisements or digital branding on social media to attract consumers in an interesting and contemporary way.